MTN Group today announced the start of its annual staff volunteer programme, 21 Days of Y’ello Care, which the company says will benefit thousands of learners and teachers from disadvantaged schools and communities across its footprint. Y’ello Care runs from 1-21 June, and sees MTN employees come together to participate in various community projects across the Group’s footprint in Africa and the Middle East. For a fourth consecutive year, staff will participate in projects under the theme of “Investing in Education for all”. In Nigeria, staff volunteers will lead efforts to deploy digital libraries in 11 secondary schools. Employees will also upgrade the teacher training e-learning centre at Onike Girls School in Lagos. The latter project involves the upgrading of existing analogue computer systems to Android, looped to a server, from which preloaded educational materials can be assessed on 10 Android systems. At the 11 beneficiary secondary schools, employees will deploy the Y’ello Tutor Portal with educational content spanning the entire secondary school curriculum. “As MTN, we are privileged to have the opportunity to again partner with our communities to improve the standard of teaching and learning in our markets. We are particularly humbled by MTNers who turn out in large numbers year after year, to support Y’ello Care projects in their respective countries. Their selfless efforts are helping ensure that their communities share in the benefits of digitisation,” says Paul Norman, MTN Group Chief HR and Corporate Affairs Officer. As part of its Y’ello Care activities, MTN employees in Swaziland will install eight interactive smart-boards, projectors and laptops at eight schools across the country. The devices will be loaded with maths, science, ICT content and curriculum from Macmillan. Training and support on the smart-board technology will be provided by staff, in partnership with Tech2Teach. To further empower teachers in Swaziland, MTN will also deploy the “21 Days of Y’ello Care e-Content Hub” Solution, in collaboration with UNISWA and Microict. This is a zero rated gateway for ICT, maths and science teachers to source content relevant to their field of speciality. In South Africa, MTN staff will hand over a computer laboratory at a school for learners with special needs in Tzaneen, Limpopo province. Another computer laboratory will be handed over to Funda Ujabule Primary School in Soweto. Employees in Ivory Coast will roll up their sleeves to participate in the construction and fitting of six classrooms at two schools. They will follow up the brick and mortar initiative with the creation of a multimedia room at each of the schools. MTN staff in South Sudan will conduct an ICT boot camp dubbed “Digital revolution”, to disseminate knowledge on ICT, offer practical lessons and share developments in technology, with primary school learners and teachers in Juba. The South Sudan team will also host sessions on ICT for girls in higher institutions of learning in Eastern Equatoria State. In Afghanistan, MTN employees will paint 20 classrooms at Kabul University, and clean three main and central streets in Kabul City. Painting will also be done at Ayesha Duranni Girls Higher Secondary School, Sorya High School, Sofi Islam School and Said Jamaluddin High School, among others. Staff volunteers in Sudan are planning to present a model of how to enhance the school environment by recycling and reusing plastic and other waste in schools, such as tyres and water glasses. Staff will collect plastic waste items from streets, markets, workshops and schools neighbourhoods. MTN staff will implement the project in three schools, with the support of students, teachers and neighbours. In Zambia, MTN will focus on translating literary materials from English to four local languages in support of government’s policy to use vernacular as a medium of instruction at primary school level. The translated material will be loaded onto interactive whiteboards to be placed at three schools. The team is also seeking to empower learners with disabilities, by providing braille printers for the blind at Munali School in Lusaka and computers for the physically challenged at Chibote Secondary School. In Botswana, MTN Business staff will provide a mobile computer facility, offering ICT teachings and interactive activities such as plant-a-tree, arts and crafts and painting of the lab, at Camphill Community Trust. The team will also provide 1MEG internet access for a period of 12 months and install software for cloud applications, windows and online training interface software. MTN employees in Guinea Conakry are focusing their efforts on the only two schools in the country that cater for children with disabilities. One of the beneficiary schools is based in Conakry and educates about 215 students, from kindergarten to grade six. Activities by MTNers at the schools will include roof repairs, painting, paving and the establishment of a computer centre with free wi-fi connectivity, as well as training for use of the ICT centre. In Benin, efforts of staff will be on enabling access to e-learning, with emphasis on students, teachers and professionals. 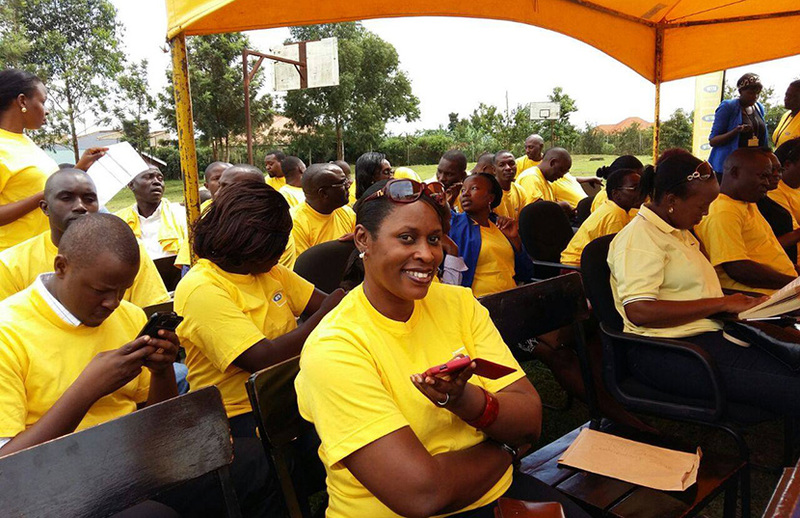 In Uganda, the MTN internet Bus project will support all initiatives during Y’ello Care, targeting the training of 2 500 people. Five regional ICT Hubs have already been established to provide training, mentorship and career guidance for learners and teachers. In Cameroon, the focus for this year’s activities is on encouraging inclusive education by building classrooms for visually impaired students and creating recreational libraries for the disabled. For the deployment of this project, MTN Cameroon staff will raise funds to finance the project, actively participate in the construction work in two schools, provide educational material and create libraries for disabled persons. In keeping with the overall Y’ello Care objective to digitise teaching, MTNers will also empower teachers on the use of social networks and organise a training session on inclusive education to improve support for learners with disabilities. Employee volunteers in Guinea Bissau will paint six classrooms at the Nhima Sanha School and Revolução de Outubro School. They will also use some of the 21 days to create a computer room for Salvador Allende High School and share their ICT knowledge with students. The key focus for MTN employees in Rwanda will be on the provision of solar system facilities for schools in underprivileged and rural areas. MTN staff will run electrical cables, fix solar panels and connect and commission batteries. As part of their secondary campaign, employees will install and provision digital books in rural schools across the country, train students and teachers in rural areas on how to access the eBooks, how to download and use the eBooks effectively in teaching and learning. In collaboration with the Rwanda Ministry of Education and Rwanda Education Board, MTN will also conduct a teacher training programme on the new national education curriculum and ICT skills knowledge. In Ghana, MTN has partnered with the NGO Read for Wealth, to conduct basic literacy lessons at the Madina Market and Takoradi Market Circle. MTN volunteers will also help to construct a 3 unit pavilion for use as classrooms at Sekyere Heman DA Primary School. In addition, the team will refurbish an ICT Centre in Teshie Presby Senior High School and conduct ICT training for teachers and learners of Tarkwa Senior High School. All MTN operations which participate in Y’ello Care stand in line to win monetary prizes, which are to be re-invested into CSI or community upliftment programmes in their market. These include the Group President & CEO prize of US$100 000, a first runner up prize of US$50 000 and a second runner up prize of US$30 000.